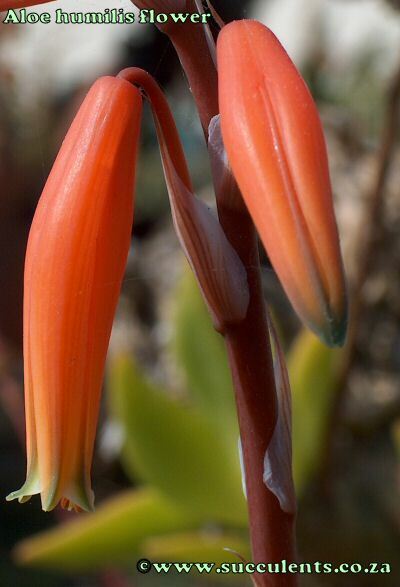 Aloe humilis is similiar to Aloe longistyla and can be easily confused with when not in flower. Aloe humilis can be distinguished from Aloe longistyla by its smaller rosettes. Aloe humilis is a variable specie and this variation is due to the various growing conditions of its distribution area. The specie name 'humilis' means 'low growing' and refers to the plants growth habit. Distribution: Found in arid areas from Mosselbay in the east through the Little Karoo to Grahamstown in the west and northwards to Somerset East and Graaf-Reinett. Stem: Dense groups of 10 or more rosette form, plants are stemless. Leaves: Leaves are 100mm in length, 12mm to 18mm wide, triangular in shape, slighlty incurved with a distinct waxy layer present on the surface. Leaf surfaces are covered with irregularly spaced tubercles. Soft white teeth, 2-3mm in length, are present on the leaf margins. Inflorescence: Simple inflorescence that is up to 350mm in height, raceme is oblong with 20 or so flowers. Flower: The large flowers (relative to the plant size) are up to 40mm in length, tubular in shape, scarlet, orange or yellow in colour, flowers narrow near the base and the mouth. Flowering Time: Flowering occurs in August and September. Light: Will tolerate light shade but the plant looks its best when grown in full sun. Watering: Careful watering especially in winter months. Frost Protection: Frost protection is required. 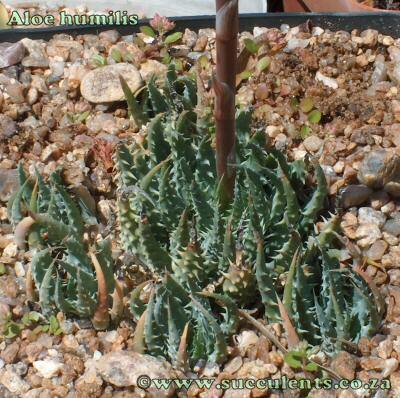 Aloe humilis forms many offsets and one can easily remove these offsets that can be placed in pots and rockeries. 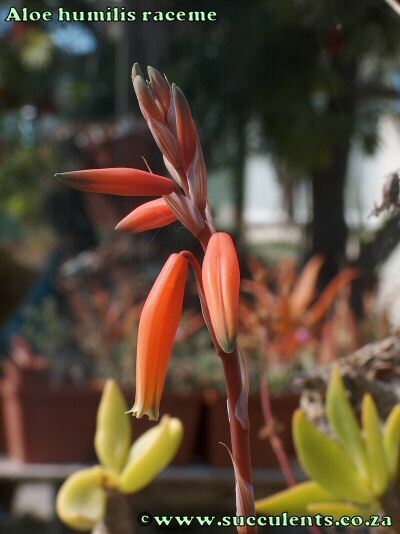 Picture: Aloe humilis in cultivation (full sun).